Spring has arrived and before you know BBQ afternoons, outdoor potlucks and picnics will be our favorite weekend pastimes. Ever since I started this blog I always check out salad bars in cafes and supermarkets to get new inspiration. This rice salad was on the menu of my favorite cafe here in Dubai, the Lime Tree Cafe. They are best known for their carrot cake (one slice is about a meal for two), but I like their sandwiches and salads nonetheless. The other day I had this rice salad in Lime Tree Cafe which I try to copy here. It is THE perfect salad to bring to a potluck or a picnic. I loved the combination of grains and lentils as a base with some mild roasted veggies, topped up with little crispy bacon cubes and pine nuts. The strong and earthy flavor of rosemary makes a dressing unnecessary. The salad is best cold from the fridge and better the next day, as the rosemary and bacon have some time to spread their flavors. The preparation is a little messy, as you may have three pots and pans on top of the stove at the same time, while the veggies and bacon roast inside the oven. By the way, for this salad I got the biggest compliment possible: my 2-year old daughter ate it with big appetite and kept on asking for more!! Cook mixed rice with 4 cups of water and some salt and a tablespoon of rosemary leaves, until tender (depending on the rice being used, about 30-45 minutes). When ready, rinse under cold water and keep aside. In another pot, cook the lentils with 1 1/2 cups salted water until cooked, about 30 minutes. Make sure the lentils still have some bite, they should not get mushy. When done, drain and keep aside. On a baking sheet, combine bacon cubes, pumpkin and bell pepper. Season with salt and pepper and fresh rosemary. Grill on the middle shelf for about 20 minutes, or until vegetables are cooked. Turn over from time to time to provide even cooking. In a dry pan, toast the pine nuts over medium heat until lightly browned, about 5 minutes. 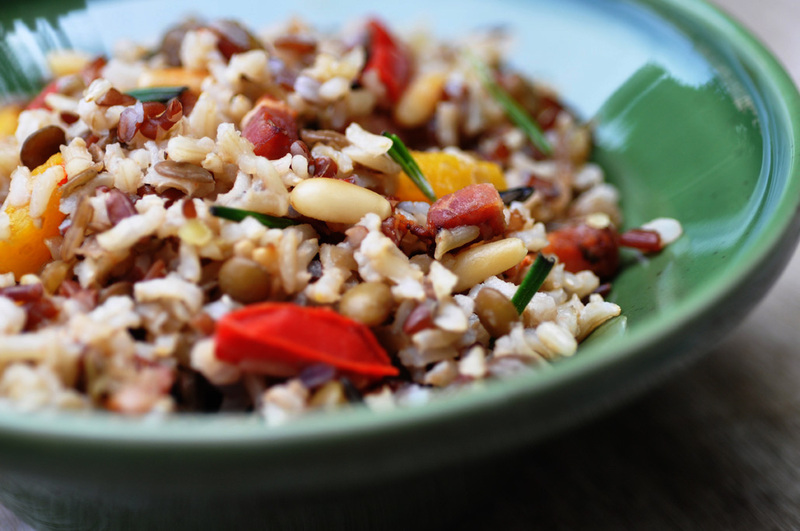 In a serving bowl, combine rice, lentils oven-roasted bacon and veggies and pine nuts. Stir until well mixed. Season with chopped fresh rosemary, salt and pepper. Keep in the fridge until cooled thoroughly. Tastes better the next day. Before serving, add feta cheese crumbles to garnish.